Need advice on how to level up your Prayer skill to a certain goal in World 330, Yanille or Rimmington e.g. level 1-99 Prayer , level 99-120 Prayer , or 200M XP in Prayer ? Worry no more, as we are here to help guide you through the best methods so that you level up your Prayer very fast and efficiently. Step 1: Prepare your inventory with noted bones, un-noted bones, and enough coins to un-note all your bones at 5 coins per bones. Step 2: Type in the desired host’s name by clicking "Friend's house" after right clicking the purple House Portal. To find out the host name, feel free to ask our community in "07 Altar" Clan Chat. After you type the host name for the first time, the "Last name:" will appear in the chatbox. You can click on that to enter the host's house instead of typing the host name manually. Step 3: Right click your bones, click "Use", and then click the Gilded altar. The game does the rest of the bones for you automatically. Step 4: Leave the house once you have no bones left. Step 5: Right click your bones, click "Use", and then click Phials NPC in Rimmington general store to un-note your bones at 5 coins per bones. Note: It helps to hide roofs so that it is easier to click on Phials NPC. 1. Go to the "Options" tab. 2. Click the "Advanced Options" option. 3. Click the "Always hide roofs" button until it has a red background. 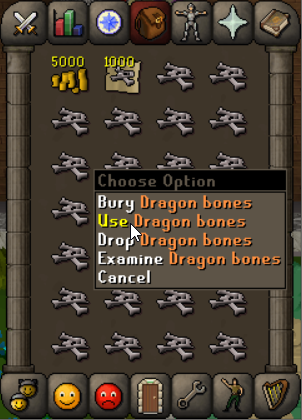 Once the interface below appears in your chatbox, you can press the "3" key on your keyboard to quickly exchange all your noted bones for un-noted bones. Step 1: Prepare your inventory with un-noted bones. Step 2: Make sure the "Teleport Inside" option is "Off" via the "House Options". Step 3: Break your Teleport to House tablet (purchasable from the Grand Exchange in Varrock) to go to Yanille in World 330. If you do not have level 50 Construction, you can use a Watchtower teleport that teleports you to the centre of Yanille (requires completion of the hard Ardougne diary). Otherwise, you can use the bank in Yanille, but it is slow and inefficient even if the POH host has at least a Revitalisation pool or better to restore run energy. Step 4: Type in the desired host’s name by clicking "Friend's house" after right clicking the purple House Portal. To find out the host name, feel free to ask our community in "07 Altar" Clan Chat. Step 5: Right click your bones, click "Use", and then click the Gilded altar. The game does the rest of the bones for you automatically. Step 6: Once you have no bones left, go to the bank to get more bones by using either the Mounted Glory to Edgeville, the Ring of Duelling (purchasable from the Grand Exchange in Varrock) to Castle Wars, or the bank in Yanille. Rimmington town in World 330 is the most popular when it comes to training Prayer . Reason being is that there is a NPC named Phials in the Rimmington general store few steps away from the purple House Portal. He un-notes items 5 coins per item, so you will never need to bank. You can just bring bones and enough coins to pay for the un-noting. Teleport to House tablets , assuming your house is in Rimmington (no Construction requirement). Alternatively, you may use a Scroll of Redirection (obtained from Nightmare Zone minigame near Yanille bank) on a Teleport to House tablet . If you do not have a house, you need to talk to an Estate Agent to buy a house for 1,000 coins. They are found in Varrock, Falador, Seers' Village, East Ardougne, and Kourend. Charged Skills necklace (purchasable from the Grand Exchange in Varrock) to "Crafting Guild", and then running due south. Yanille city in World 330 is an alternative for training Prayer . Level 50 Construction is recommended as you will be able to move your house to Yanille to quickly teleport to Yanille. A bone runner can be a great way to quickly gain experience, but it can be a little costly such as 5,000-10,000 coins per inventory. If none of those options meet your fulfilments, you can use the Watchtower teleport if you have completed the hard Ardougne diary to teleport to the centre of Yanille. As a last resort, you can run to the bank in Yanille, but it is not recommended as it is slow and inefficient even if the POH host has at least a Revitalisation pool or better to restore run energy. Teleport to House tablets , assuming your house is in Yanille (requires level 50 Construction). Alternatively, you may use a Scroll of Redirection (obtained from Nightmare Zone minigame near Yanille bank) on a Teleport to House tablet . You need to talk to an Estate Agent to move your house to Yanille for 25,000 coins. They are found in Varrock, Falador, Seers' Village, East Ardougne, and Kourend. Watchtower teleport . It is more convenient if it teleports you to the centre of Yanille (requires completion of the hard Ardougne diary). Ring of Duelling to "Castle Wars", and then running due east. Nightmare Zone minigame teleport. Minigame teleports have a cooldown of 20 minutes. To use this minigame teleport, it requires completion of at least 5 of the quests listed here. For those unsure how Gilded altars work, they alone give 250% of the experience you would have gained if you had buried your bones. They have 2 burners , one on each side. Each type of burner gives 50% bonus XP in Prayer if they are lit by a Tinderbox and Clean marrentills (purchasable from the Grand Exchange in Varrock) requiring level 30 Firemaking. So overall, it is a total of 350% bonus XP in Prayer ! Lit burners last between 2 minutes 10 seconds and 4 minutes depending on the Firemaking level of who lit the burner . They are usually lit by hosts nowadays, so you do not need to worry about bringing a Tinderbox and Clean marrentills . All you need to bring is your bones. You may also bring Teleport to House tablets if you are going to use them. Big bones give 52.5 XP. Babydragon bones give 105 XP. Dragon bones give 252 XP. Lava dragon bones give 297.5 XP. Dagannoth bones give 437.5 XP. Superior dragon bones give 525 XP. Note: During this calculation, it was assumed the Teleport to House tablets teleport your character outside the purple House Portal instantly. In addition to that, the Revitalisation pool or better was used to restore run energy % in Yanille. For those unsure of what the 1 tick method is, it involves using a bone on the Gilded altar on the same tick as the animation that your character performs to offer 2 bones at the same time. On average, bone running allows you to use up an additional 100-1300+ bones per hour. 1250-1350 bones/hour- AFK method (running to Phials NPC and back). 1450-1550 bones/hour - AFK method (paying a player to bone run). 1800-2200 bones/hour - 1 tick method (running to Phials NPC and back). 2800-3300 bones/hour - 1 tick method (paying a player to bone run). 850-900 bones/hour - AFK method (running to Yanille bank and back without teleports). 1000-1100 bones/hour - 1 tick method (running to Yanille bank and back without teleports). 1450-1550 bones/hour - AFK method using Teleport to House tablets . 1400-1450 bones/hour - AFK method (paying a player to bone run). 1800-2200 bones/hour - 1 tick method using Teleport to House tablets . Those using the Yanille method pay an extra 500 coins or more per inventory if using House tablets . Overall, Rimmington is the most efficient place to train Prayer in both XP and GP wise. There are many ways of finding out how much XP is needed for your next Prayer goal , especially with third party clients. But in this guide, I will just be explaining how to do it on the official client downloaded from the Old School RuneScape website. You are able to set a Level or XP Target for the Prayer skill by right clicking the XP button near your minimap and clicking "Setup XP Drops". Then you can select any of the 3 check boxes depending on what you would like the XP Tracker to display on your screen. Depending on which check box you selected, you will see different overlays when you hover your mouse cursor on the XP Drops interface near your minimap. how much XP you started off with and the total XP gained since then. how much XP is remaining until your end point goal in Prayer (XP or level).